Okay, that intrigued me and challenged me. My sister is on a diet. I need to diet. Don’t want her loosing and I’m not so I found out what the diet was and went out and purchased the book. Of course I was at a disadvantage as I had not read it yet, but not wanting to be left behind I found and downloaded a cheat sheet off the internet I could use to muddle my way through the first week or so till I finished reading. I am now on Week 3, and although I haven’t lost as much as I would have liked, probably due in part to my start without a full understanding of the diet, a couple flub-ups here and there and my refusal to give up coffee 100%, I must say it is a great plan for energizing your metabolism and the information in the book in and of itself is fascinating. The book provides information on the reasons why she eliminates certain foods from the diet, such as wheat, corn, soy, dairy and caffeine. It makes sense. The book says that it resets your metabolism and I believe it does. I have more energy and feel better than I have since a bad accident I was in five years ago. I am wondering if that intense set-back got my metabolism out of whack and it never corrected itself. This plan has an all-around health benefit. I am more relaxed yet more energized all at the same time. I find I am sleeping better, more sound. I have degenerative arthritis in an ankle that was severely injured in the accident and prior to starting this diet was taking a considerable amount of ibuprofen in addition to my prescription anti-inflammatory medication. I have only used ibuprofen once, maybe twice in the three weeks since I started the diet. The diet is easy to follow. It is a 3-phase process through each week to keep your metabolism guessing and active. It is eating all fresh, non-processed foods, and only sprouted grain products. It is a bit of a stab at the grocery store, but the food tastes so much better and is amazing. No chemicals, no nitrates. Just good flavorful food, and nothing canned; fresh or frozen only. Fresh fruits, fresh vegetables, grains that meet criteria such as sprouted breads and wild rice, and a variety of meats, just make sure they are nitrate free. The hardest adjustment to the diet is having to consume water equivalent in ounces to 50% of your body weight, so if you weight 160, you have to drink 80 ounces of water per day, if you weigh 180 you would drink 90 ounces of water per day, etc. I don’t find getting the water down hard, but it takes a while for the body to adjust so trips to the restroom are dramatically increased. One surprise, I am down from drinking a full 10-cup pot of coffee plus about 32-48 ounces of tea per day to only 1/2 of a pot, the equivalent of 5 cups of coffee in the morning. No more caffeine the rest of the day. Even more surprising was that I never experienced the caffeine withdrawal headaches. I assume another benefit of this eating plan. One thing I failed to mention, this is a 28-day plan. You can do as many 28-day cycles as you want. You can do the plan for 28 days, take a break then start back on it again. The plan is to re-set your metabolism so that you have more energy and when you do eat high sugar, consume alcohol, eat a high-fat product your body’s metabolism is working at its peak and can digest and process the food through your system properly. 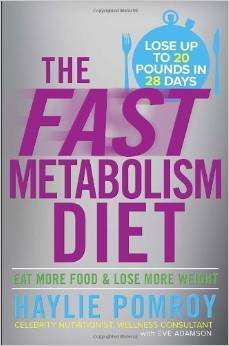 Whether you are in need of loosing weight, feel sluggish, or want to eat a healthier diet, I recommend reading The Fast Metabolism Diet.